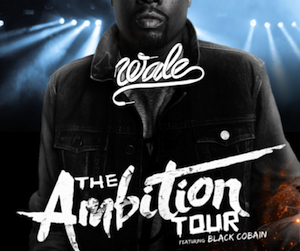 Wale Ambition Winter Tour Coming To A City Near You! D.C. rhyme-spitter Wale is taking his ambitions on the road then year. The Maybach Music Group artist has announced dates for his ‘Ambition’ tour, in support of his sophomore album of the same name. The 28-city North American trek kicks off Dec. 30 in Atlantic City, N.J. (which is already sold out!) and stretches through the Midwest, Canada, Northeast and Southwest before wrapping positive in the Bahamas on March 6. In February, Wale will team positive with singer Miguel for a pre-Valentine’s Day shows in New York (Feb. 10) and Los Angeles (Feb. 13), respectively. In addition, the rapper will perform concerts during Super Bowl weekend, NBA All-Star weekend and CIAA weekend. Wow! Wale is going to be one busy performer in 2012. Meanwhile, Wale just released a new video for his latest release ‘Chain Music‘ and has begun production on a video for ‘Slight Work,’ his collaboration with Huge Sean. R&B crooner Chris Brown is directing the clip in Los Angeles.